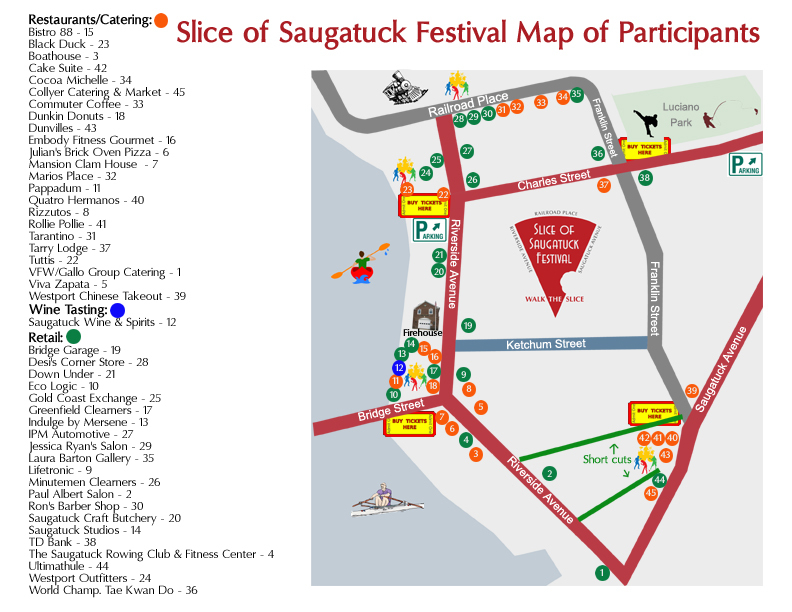 Please click through to see the full map on the Slice of Saugatuck page. Right by the water in Saugatuck you’ll find three streets that form a giant triangular “slice” of life for Westporters and Connecticuters. Railroad Place is to the north, Riverside Avenue by the water is to the west, and Franklin Street is to the-wait for it…east. Whether you want to go out for some food, check out the variety of wine, beer, and liquor, or find something exciting to do, this area of Westport isn’t lacking one bit. 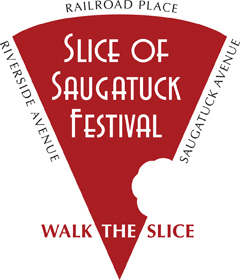 And, to help you see this and to celebrate it we have the Second Annual Slice of Saugatuck! You’ll be able to check it out on Saturday, 9/15 from noon to 3 pm by only paying a measly, tiny, incomprehensible $5 at one of the festival entrances. Just think about it: $5. 5$. Five dollar entrance. If you got that joke, you’re as lame as us, btw. Well, what do you get in return for that $5? First of all, you help to raise money for Homes for Hope/Gillespie Center Food Pantry. Secondly, to put it bluntly, your own little slice of heaven. Free food samples, free wine and liquor samples, free live music, free rides on a kayak, learn how to fly fish, take a tour of their historical fire house, stock up on discounts/coupons, watch a Tae Kwon Do demonstration, check out all the local shops, and–yes–more. Yeah, that’s amazing, especially when you count out that there are 39 different places participating this year, with 24 of those being food and drink tastings. Yeah, it’s like when you go to Costco and you have lunch by trying samples. Well, this is way more epic and with all these stops you’ll probably fill up for the rest of the weekend! When you’re done (is that possible?) checking out all the activities and samples, you can head back to Railroad Place where the street will be a block party. Woot woot! To even blow your mind more, you’ll realize that there are lots more places along the way for you to stop and check out. Before we dish out all the details of who is participating, we just want to let you know that you should park on Riverside Avenue under 95 in Railroad lot #5. Cannot wait to go! Loved it last year. How was it last year? What did you like the most? I think my favorite food was from Tutti’s & Rizzuto’s. It was nice meeting up with neighbors and friends and simply just watching everyone having a good time. Seeing friends from all over Westport, and a great ambiance of cooperation. Great that they’re raising money for the Gillespie Center this year. A bargain, a downhome event! Linda, it’s pretty amazing when you see something like this come together. You have little shops, medium shops, and big shops, all coming together…working together to build up the community and to make a difference. We love it. I loved all the scrumptious food samples. It was also fun meeting up with neighbors and friends.